Reciprocity: The obligation to give back. Social Proof: The power of consensus, doing what we feel others are also doing. Liking: The obligations of friendship, or of being swayed by people you like. Consistency: Need for personal alignment. Authority: We follow those we view as experts. 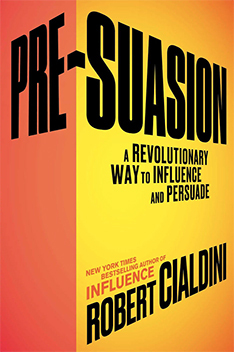 Now, after 30 years, Professor Cialdini presents the public with a new book: Pre-Suasion: A Revolutionary Way to Influence and Persuade. What separates good communicators from truly successful persuaders? Using the same combination of rigorous scientific research and accessibility that made his Influence an iconic bestseller, Cialdini explains how to capitalize on the essential window of time before you deliver an important message. Altering a listener’s attitudes, beliefs, or experiences isn’t necessary, says Cialdini—all that’s required is for a communicator to redirect the audience’s focus of attention before a relevant action. This is an important point that should also raise eyebrows: the factor most likely to determine a person’s choice in a situation is often not the one that offers the most accurate or useful counsel; instead, it is the one that has been elevated in attention (and thereby in privilege) at the moment of decision. How does one channel attention? Here’s a fascinating example from the book – filling out surveys. The prevailing problem for consumer research organizations is that the public (us) can’t be bothered to participate in their surveys, focus groups, and taste tests. Even with sizable inducements in the form of cash payments, free products, or gift certificates, the percentage of people agreeing to cooperate can be low. Could these researchers eliminate their problem by requesting consumer information in the moment following a pre-suasive question? The short answer is a spectacular yes – with response rates rising from 29 percent to 77.3 percent. How? Without resorting to any of the costly payments that marketers often feel forced to employ, they began the interaction with a pre­-suasive opener: “Do you consider yourself a helpful person?” Following brief reflection, nearly everyone answered yes. And, in that privileged moment-after subjects had confirmed privately and affirmed publicly their helpful natures-the researchers pounced, requesting help with their survey. 77.3 percent volunteered. This principle of “elevated attention” also determines who wins elections. According to this view, in an election, whichever political party is seen by voters to have the superior stance on the issue highest on the media’s agenda at the moment will likely win. The media does influence opinion. In the summer of 2000, a pipe bomb exploded at the main train station in Diisseldorf, Germany, injuring several Eastern European immigrants. Although no proof was everfound, officials suspected from the start that a fringe right-wing groupwith an anti-immigrant agenda was responsible. A sensational aspect of the story-one of the victims not only lost a leg in the blast but also the baby in her womb-stimulated a rash of news stories in the following month regarding right-wing extremism in Germany. Polls taken at the same time showed that the percentage of Germans who rated right­ wing extremism as the most important issue facing their country spiked from near zero to 35 percent – a percentage that sank back to near zero again as related news reports disappeared in subsequent months. We have the tendency to assign undue levels of importance to an idea as soon as attention is turned on it. If elevated attention provides pre-suasive leverage, are there any features of information that automatically invite such attention and therefore don’t even require a communicator’s special efforts? Cialdini points to three naturally occurring commanders of attention: the sexual, the threatening, and the different. The communicator who can fasten an audience’s focus onto the favorable elements of an argument raises the chance that the argument will go unchallenged by opposing points of view, which get locked out of the attentional environment as a consequence. Certain kinds of information have the power to combine initial pulling power with staying power: the self-relevant, the unfinished, and the mysterious. In July 2007 the Afghan Taliban kidnapped twenty-one South Korean church-sponsored aid workers, holding them hostage and killing two as a savage initial show of will. Talks designed to free the remaining nineteen went so badly that the kidnappers named the next two hostages they planned to murder, prompting the head of the South Korean National Intelligence Service, Kim Man-bok, to fly in to try to salvage the negotiations. He brought a plan. It was to connect the South Korean bargaining team to something central to the group identity of the militants: their language. Upon his arrival, Kim replaced his head negotiator, whose appeals had been transmitted through an Afghan translator, with a South Korean representative who spoke fluent Pashtun. There is also a geography of influence. Just as words and images can prompt certain associations favorable to change, so can places. Thus, it becomes possible to send ourselves in desired directions by locating to physical and psychological environments prefitted with cues associated with our relevant goals. It’s also possible for influencers to achieve their goals by shifting others to environments with supportive cues. For instance, young women do better on science, math, and leadership tasks if assigned to rooms with cues (photos, for example) of women known to have mastered the tasks. So those posters in classrooms do, in fact, make a difference! Cialdini reveals an additional universal principle of influence: unity. There is a certain type of unity-of identity– that best characterizes a We relationship and that, if pre-suasively raised to consciousness, leads to more acceptance, cooperation, liking, help, trust, and, consequently, assent. One way to build We relationships is by presenting cues of genetic commonality associated with family and place – genealogy and geography. We relationships can also result from acting together synchronously or collaboratively. When people act in unitary ways, they become unitized; and when such activity is arranged pre-suasively, it produces mutual liking and support. This principle explains greater helping among strangers, cooperation among teammates, self-sacrifice among children, friendship among school children,love among college students, and loyalty between consumers and brands. Those using a pre-suasive approach must decide what to present immediately before their message. But they also have to make an even earlier decision: whether, on ethical grounds, to employ such an approach. Cialdini sees that communicators from commercial organizations place profit above ethics in their appeals. Thus, there is reason to worry that the pre-suasive practices described in this book will be used unethically. The professor argues against unethical use, offering data from studies indicating that such tactics undermine organizational profits in three powerful ways. Companies that are unethical will suffer the consequences through 1) poor employee performance, 2) high employee turnover, and 3) employee fraud and malfeasance. Those who live by the sword, etc. etc.. I’m not sure these arguments will stop unethical people from being unethical. Perhaps this is why we will increasingly need stronger consumer protection laws to prevent psychological manipulation. That is a question left to governance and democracy, but companies should be acutely aware of the potential for abuse. This book, like Cialdini’s previous one, is an instant classic and worth reading with elevated attention.